Available in either a 4' or 5' width, the delightful LuxCraft Heart Cut Out Swing is cozy, lovely and inviting. This is the place to relax with your favorite book and beverage after a long day. Children will love to swing on this pretty addition to your outdoor scene. 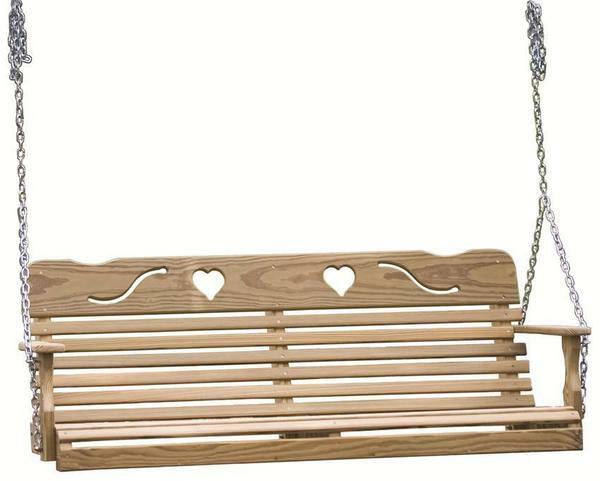 The delicate heart cut outs on the swing back add charm and beauty to this solid wood Amish made swing. You'll want to get some fun family photos outdoor with this pine wood swing providing the perfect backdrop. Handcrafted for you in Ohio, our skilled Amish craftsmen build each Amish swing with a focus on durability, beauty, and longevity. Their experience combined with the premium quality of the materials used result in a swing that will withstand the test of time. At DutchCrafters, we offer the widest selection of Amish porch swings online. Be sure to take a look at our wooden swing stands and A-frames that are all Amish handcrafted as well and don't forget our exciting collection of Amish Outdoor Porch Rockers! This Amish swing usually ships within 1 week of purchase if the unfinished option is selected. If you select the finished option for this item please allow 2-3 weeks for staining. This Amish swing comes with stainless steel hardware and a stainless steel chain. Please call one of our Amish furniture specialists at 1-866-272-6773 with questions or for assistance with your order.